Tableau, as we all know, is the go-to tool for visualization, today. R is an open-source statistical language used by academicians, statisticians, data analysts and data scientists to develop machine learning models. R’s success must be owed to the power of its packages. scope and power to run different analyses and deliver the results to the interface in an easily interpretable way for the business user to understand and take decisions. Tableau can be used to develop beautiful dashboards which can serve as a very good user interface. R can be used to develop and run complex machine learning models, behind the hood, whose results can be displayed in Tableau dashboards in an easily interpretable way. In short, by linking Tableau and R, you are giving the business users the opportunity to create enormous business value by running and analyzing the results of complex machine learning models without having knowledge or experience in R! How to connect Tableau with R? Now, R should print ‘Starting Rserve…’. 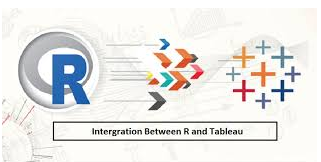 If you got this, then R is reaching out to Tableau for connecting. Open Tableau & click on Help > Settings & Performance > Manage External Service Connections. In the dialog box that opens, choose ‘localhost’ for Server and type ‘6311’ for Port. Now, you should get a dialog box stating, ‘Successfully connected to the R serve service’. If you got this, you are all set to use the power of R from within Tableau. All companies maintain a database containing details about their customers. Customer Segmentation using clustering algorithms is a proven technique used by companies to understand its customers. This helps you offer targeted deals that convert better! The objective of this article is to create a dashboard where an executive from wholesale business can segment his customers using R from within Tableau, without having to know R Programming, just by clicking in the dashboard. Then, visualize the different customer segments to find patterns that can be used to make business decisions like providing incentives, discounts, etc. The dataset for this can be downloaded in CSV format from UCI Machine Learning repository by clicking on ‘Data Folder’ link at the top left of the page. In this dataset, each row contains details about a customer of the Wholesaler regarding his channel, region and the dollar amount spent by him on different product categories like Fresh, Frozen, Grocery, Milk, Detergent Paper & Delicassen. This dataset can be mined to understand the buying patterns/characteristics of customers based on their spending. Let’s cluster users based on their spending in different categories using k-means clustering algorithm. K-Means is a unsupervised learning algorithm that identifies clusters in data based on similarity of features used to form the clusters. In our case, these features would be the customers spending in different categories. Let’s give the option of specifying the number of clusters to be formed to the user who is going to use the dashboard by creating a Tableau parameter. To do that, right click on the Measures pane and click on ‘Create Parameter’. Fill the Create Parameter dialog box with details as shown below and click OK.
Line 1: Sets seed, so that the results can be regenerated again if needed. As already said, K-means choses the center points at random and starts assigning data points to these cluster centers. The clustering results will change if these center points change. So, seed is used to define the random numbers generated so that if you set the same seed and run, the same center points will be taken up for clustering. Line 2: Combines all features (i.e. the customer spends in each category) that must be used for clustering into a data frame. Line 3: Runs the k Means model 20 times, in the above generated data frame, with as many cluster centers as specified by the user in the dashboard. Line 4: The best model out of the above 20 is picked and its results are returned to the Cluster_kmeans calculated field in Tableau, which can be used in visualizations. You can adjust the tooltip to reflect the information that you deem necessary/relevant at this point. This sheet describes the spend of each cluster in Delicassen and Detergent Paper categories. Since, we fixed all Y axis to the same range, these charts are comparable across too. We, at Perceptive Analytics, feel that the main aim of any business intelligence dashboard is to deliver insight and inspire action of the business users. Because, business value will not be created until any one of them acts on the insights! It is our (dashboard designer’s) job to make sure that the dashboard is designed in a way such that the business users does not have to spend more time searching for insights or trying to understand the dashboard. They should spend very less time in organizing data & more time in interpreting information / insights and creating / strategizing action plans. In this article, we created a dashboard using which a business user can segment his customers and visualize the spending patterns of different clusters to understand the customers better. We leveraged the power of R to segment the customers from within Tableau itself. This knowledge can be used to take business decisions like offering trade discounts or targeted promotional offers. This article was contributed by Perceptive Analytics. Perceptive Analytics provides Tableau Consulting, data analytics, business intelligence and reporting services to e-commerce, retail, healthcare and pharmaceutical industries. Our client roster includes Fortune 500 and NYSE listed companies in the USA and India.